In our commitment to help you find products that can actually deliver, we’re presenting our top choices for the best makeup remover for dry skin. After more than 15 hours of work, we were able to determine the top performing products based on their ability to completely get rid of makeup without drying the skin out as well as their friendliness to the budget. Neutrogena Hydrating Eye Makeup Remover Lotion is very affordable. Despite its low price point, the product can actually deliver what it says it can do. It can hydrate your under eyes while removing your makeup. If you are looking for a multipurpose product, NUXE Rêve de Miel Face Cleansing and Makeup Removing Gel might be your best choice. It works as a makeup remover and face cleanser in one. It contains honey and smells and feels that way, too. For an easy and quick way to remove makeup, we highly recommend Burt's Bees Facial Cleansing Towelettes. This one's infused with cucumber and sage extracts which fit the needs of dry skin. Take note that although beneficial for hydration, sage still has the potential to cause skin irritation. Physicians Formula Eye Makeup Remover Lotion is dermatologist-approved so you can be sure that it's safe to use on dry and sensitive skin. It has a gel to cream-like texture which perfectly fits your skin type. Pond’s Cucumber Cleanser is fresh and light on the skin. It’s non greasy as well despite the ability to provide moisture while removing makeup. The product is highly rated for its cucumber extract which is known for its hydrating and refreshing effects. Aside from cucumber, this makeup remover also has mineral oil that can effectively lift up dirt and makeup from your skin. I find this product really easy to use. You simply have to get an ample amount and massage it on your skin. Work the product until you feel that you’ve completely covered your face. There’s no need to rub vigorously so you can essentially avoid creating minute tears on your skin. Once you’re done, you can wipe the cream with a tissue or lightly rinse with a warm water and that’s it! For its size and price, I’d say this product can give you the best bang for your buck. It gets the job done and it’s gentle enough for your dry skin. Neutrogena Hydrating Eye Makeup Remover Lotion is a facial lotion and makeup remover in one. It effectively removes waterproof makeup while providing hydration to your skin. With cucumber and aloe extracts, this makeup remover is safe enough to use everyday. It promises to remove dirt and other impurities in your skin while conditioning your under eye area. It’s light and free from residue. It instantly dissolves as soon as applied on the skin which I think is great since you won’t have to spend a lot of time doing your skin care at night. However, compared with ones that have a runny consistency, this one doesn’t seep into the eyes which means there’s less chances for it to cause irritation. Despite this, I still suggest that you don’t apply it too close to your eyes. For the product to work, you only need to take a pea size amount of the product, massage it on your eye area and leave for a couple of minutes to completely dissolve heavy eye makeup. Since a little goes a long way, the 3 oz makeup remover can last you a long time. Aside from its high content, it’s relatively cheap, too. Infused with honey and sunflower extract, NUXE Rêve de Miel Face Cleansing and Makeup Removing Gel can remove your makeup without making your skin even drier. It has a gel and soap-free formulation to perfectly suit your skin type. The product comes in a pump bottle which I actually enjoyed since it makes dispensing easier. It contains a lot of product, too with 6.7 fluid ounce. It has the scent of honey and even looks like one. It pumps out thick but it melts onto the skin. What’s special about this product is that it also works as a facial cleanser. Unlike other cleansers, however, this one doesn’t greatly foam up but it does lather nicely. For stronger eye makeup, this remover may fall short a bit. If you like waterproof mascara and eyeliner, you may have to keep a separate makeup remover available. 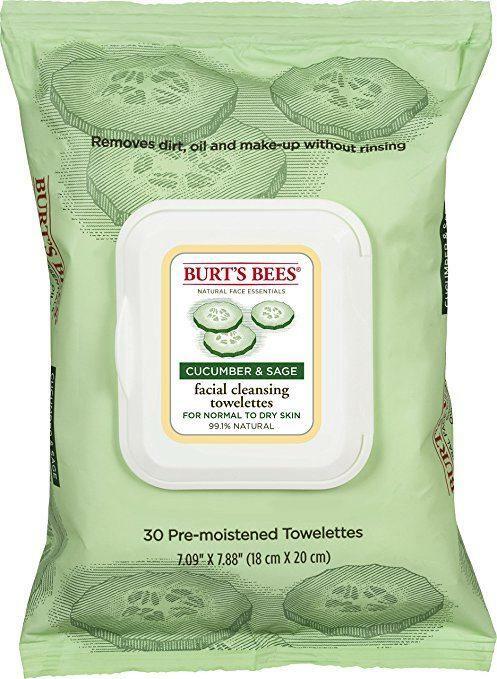 For your busy days, Burt's Bees Facial Cleansing Towelettes, Cucumber and Sage can be a great help. It has 30 cleansing towelettes which you can use in getting rid of dirt and makeup on your face- without rinsing. On top of this convenience, the product is also infused with cucumber and sage which are beneficial ingredients for dry skin. These two components have the ability to increase h﻿﻿﻿﻿﻿﻿ydratio﻿﻿n while decreasing irritation. The wipes have been tested by ophthalmologists and dermatologists for your safety. They are free from parabens and even petrolatum. Despite these benefits, I’d still not recommend this wipes to those with extra sensitive skin. Aside from that the wipes are scented, its sage component also has camphor which is a known skin irritant. If you’ve been having a hard time, finding a makeup remover that can remove water resistant eye makeup without leaving your skin dry, then this product is the one. Physicians Formula Eye Makeup Remover Lotion is hypoallergenic and fragrance-free so you’re practically safe from irritation. It’s even dermatologist approved to be non-irritating. This product has a creamy formula, more like in between a cream and a lotion, which you can work on your eye area without the sting you’d normally get from oil-based cleansers. And the best part is that it doesn’t leave any waxy residue on the skin. Instead, you get extra moisture on your under eye areas. It will leave your skin clean without dryness. You also don’t need to use too much effort or rubbing since the product effectively melts makeup. Removing makeup isn’t as easy as it sounds. If you’ve been getting dehydrated skin and breakouts despite religiously taking off your makeup at night, then you know exactly what I’m talking about. A lot of people know that makeup removal is essential no matter what the skin type is. Unfortunately, there’s also a large number of people who aren’t really aware of how it should be done. Wipes can remove makeup as well as dirt, but their actions are kind of limited. Unlike cleansers, they can’t lift off the deep seated dirt and makeup residues on your pores. As a result, your pores get clogged and acne happens. To prevent this from happening, make sure to use a good facial cleanser after you remove your makeup with wipes. The extra step can save you from a lot more problems than just your dry skin. Mascaras and eyeliners are the most difficult makeup items to remove, especially those waterproof ones. Because they can be stubborn, it’s quite easy to just give up and let them be. This is where bad things can happen. Incomplete eye makeup removal can give you more serious problems than just acne. It can lead to serious infections, bloodshot eyes and severe eye itching. Since some removers contain harsh chemicals can dehydrate the skin, you have to make sure that you’re using the right product for your skin type. For dry skin, stay away from alcohol-based removers since they can only dry out your skin further. Aside from this, you also need to be aware of your remover’s pH level. Anything that’s too alkaline can disrupt your skin’s natural barrier and strip it of its natural moisture- a very bad combination for your skin type. Long lashes and defined eyes are really fun to show off- not until it’s time to get your cosmetics off. Since they are in the most delicate area of your face, you have be gentle and thorough in removing them. Waterproof mascaras and eyeliners are difficult to remove but this doesn’t mean that you have to be harsh during the process. Instead of rubbing, hold a piece of cotton ball containing your remover to your eye area for a couple of seconds. Once your makeup has melted, gently wipe the cotton ball over your closed eyes. You can repeat as necessary but be sure to remain gentle. Avoid washing your face before using your eye makeup remover. This is to avoid leaving behind residues that can irritate the eyes. The areas around your eyes are delicate which means you can’t use just about any product on it. Find a moisturizing eye makeup remover to make sure you don’t dry out the area which can lead to lichenification and wrinkles. Dry skin needs extra attention and care, especially when it comes to makeup removal. Using the wrong product or ingredient can cause a lot of discomforts and more serious skin issues. Because we know how hard it is, we’re recommending Pond's Cucumber Cleanse﻿﻿r as the best makeup remover for dry skin. It contains a good amount of product for its price and is capable of delivering what it says it can do.